Clouds of charged particles move along a pulsar's magnetic field lines (blue) and create a lighthouse-like beam of gamma rays (purple) in this illustration. While nothing with mass can move faster than the speed oflight, scientists now think some weird, faster-than-light currents may be thepowerhouse for fast-spinning stars. The idea may sound heretical to one of most deeply heldtenets in physics, which states that the speedof light is the ultimate speed limit. But the new proposal squeaks by on a loophole in that rule,which insists only that no mass or information exceeds the speed limit. In this case, a faster-than-light current would pass throughcertain rapidlyspinning stars. This would cause positively charged atoms in the star tomove in one direction and negatively charged atoms would move in another. Eachindividual particle would move slower than the speed of light, but the wave ofmovement would pass through the star at a rate more rapid than light speed. "No laws of physics were broken or harmed in thisproduction," said researcher John Singleton of Los Alamos NationalLaboratory in Los Alamos, N. M. "This is not science fiction; it?sreal." Singleton and his colleague Andrea Schmidt, also of LosAlamos, proposed this process to explain how certain mysterious stars called pulsarsshine. These stars are very dense and rapidly spinning, and emit a beam oflight like a lighthouse. Exactly how pulsars do this has been a mystery. 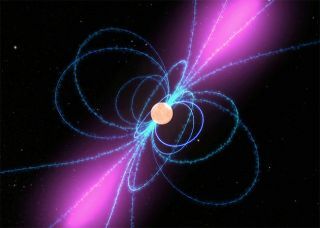 The researchers think that pulsars' rotating magnetic fieldscreate this current, which pushes the charged particles off in differentdirections, resulting in a focused burst of light. "We think we can explain virtually all observational datausing this method," Singleton said. Nonetheless, it's a somewhat radical idea, so the scientistsaren't expecting everyone to agree with them immediately. "This essentially is a completely new approach topulsars, so will be treated with a great deal of hostility until it settlesin," Singleton said. He and Schmidt presented their research this month at the215th meeting of the American Astronomical Society in Washington, D.C.